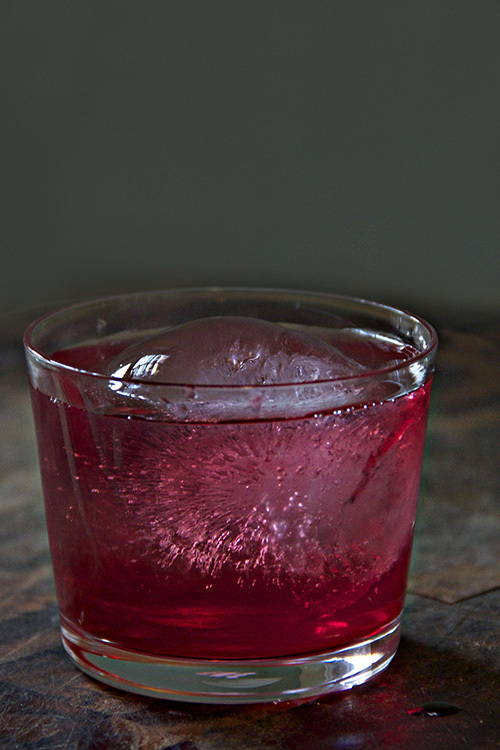 Continuing on our quest to bring you delicious and festive holiday cocktails I proudly present the Hibiscus Moon (the best part of this is picking names, right?). 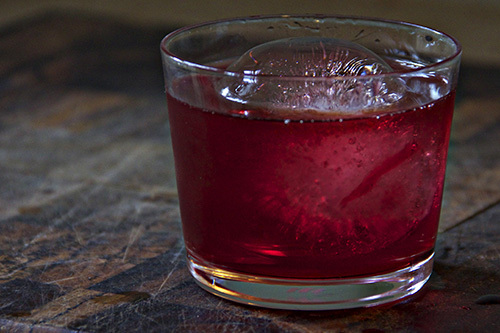 A combination of hibiscus tea, moonshine, honey, and bitters it is simple yet packs a powerful punch. And, beautiful. A perfectly wintery cocktail. When I was in college hibiscus tea was my favorite afternoon drink. During breaks in class I’d pop into the campus cafe for a cup of Tazo’s Passion, which is hibiscus, orange peel, rose hips, and passion fruit. I’ve never been a smoker and I didn’t start drinking coffee until after college, so a cup of tea was my favorite way to unwind or break the stress of a long studio class. When I was dreaming up mixers for these winter cocktails it struck me how perfectly this tea would compliment moonshine. It’s tart and full, strong enough that it can be paired with a strong alcohol yet full of subtle, nuanced flavor. Combined with a few tablespoons of local honey to sweeten it and it was done before I knew it. One of Dan’s Christmas presents this year (we opt for a 25 days of Christmas approach, exchanging gifts over the course of the month of December) was a mechanism for making large ice spheres. 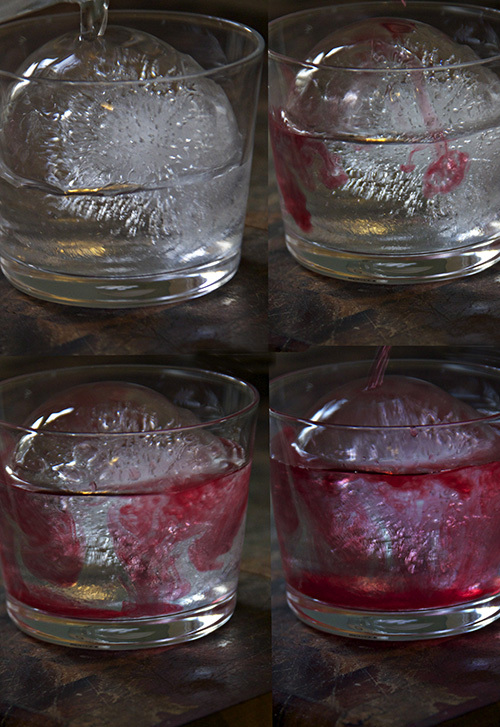 These giant pieces of ice are ideal for cocktails where you don’t want your drink to be watered down (because they melt slowly) but might taste better served on the rock. Not to mention they’re quite the statement piece. 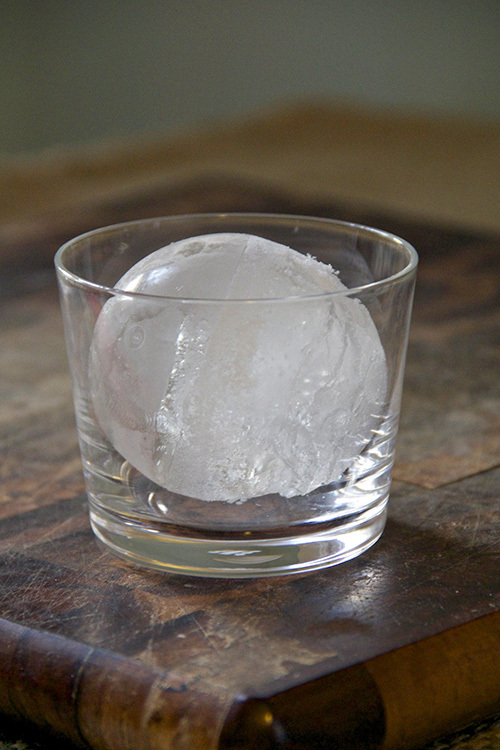 Nothing makes turns a regular cocktail into a serious cocktail like a giant ice sphere. 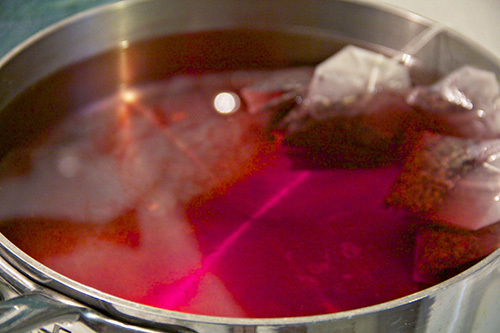 In a medium saucepan combine 6 cups water with 6-8 hibiscus teabags (we used Tazo Passion). Bring to a boil and then let cool. As it’s cooling stir in 3 tablespoons honey. Remove teabags and refrigerate the tea until chilled. Combine two fingers moonshine (or vodka), and three fingers tea. Add a splash of bitters and serve on the rock(s). This post is not sponsored by Tazo, I just happen to love their tea. It’s also not sponsored by Midnight Moon. 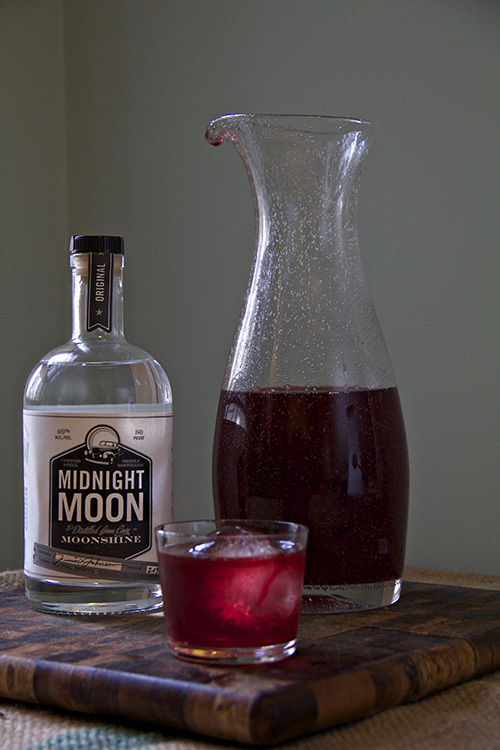 I just love their moonshine (made in NC). Beautiful drink. Tell me about the gizmo that makes the large ice ball. Love your photographs. Fantastic post, just wondered what you ment when you say a “splash” of bitters !!! i see there’s different flavors and such !! Hey! The bitters we have are just “aromatic bitters” but anything citrusy would probably be ideal. Orange, lemon, blood orange, etc. And I did a quick shake. Thank you very much for the reply !! i ordered a couple of your bottles and can’t wait to try for the heartburn and such !!! thanks again ! !